Why are we campaigning for this? Lambeth Council and Metropolitan Police have the power to take decisive action on anti-social behaviour by introducing a new dispersal zone on the Studley and Stockwell Gardens estates. Your local Labour action team – Councillor Imogen Walker, Councillor Pete Bowyer and Alex Bigham are gathering signatures for a petition backing a dispersal zone. The zone would enable the police to tackle youths and gang members who engage in activity that is intimidating or concerning to residents. 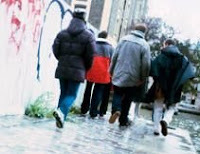 From talking to people on both the Studley and Sotckwell Gardens we know that many people are worried about youths who hang round outside the entrances to blocks or on stairwells causing a nuisance. We will not tolerate anti-social behaviour of any kind, and a new dispersal zone could help make our community a safer place to live. Residents have told us about their concerns, and as your local Labour team, we will not hesitate to take tough action. No-one should feel intimidated our threatened on their own doorstep. What is a dispersal zone? A Dispersal Zone gives Lambeth police greater powers to tell individuals to leave an area where their presence is causing local residents and the business community to feel threatened and intimidated. Those asked to disperse from the area will have their names and addresses taken by officers, with repeat offenders being put forward for further enforcement including an Anti-Social Behaviour Order (ASBO). Dispersal Zones are not curfews or blanket bans. They do not prevent anyone from entering the designated area, but they address anti-social behaviour through curtailing two or more persons present in that area for up to 24 hours. Lambeth Council and police have enjoyed a great deal of success in using dispersal zones to tackle anti-social behaviour in specific locations of the borough. A new dispersal zone was introduced in Brixton last year, which brought a big decrease in anti-social-behaviour from drug dealers, drugs users, and aggressive begging. A dispersal zone was also used to successfully tackle a group of anti-social youths who had been intimidating local residents and businesses in Dorset Road in Stockwell last year. Members of the public can report crime and anti-social behaviour to the council on 020 7926 4000 (9am-6pm) or call Stockwell’s local police team on 020 8721262 or 07920 233836.